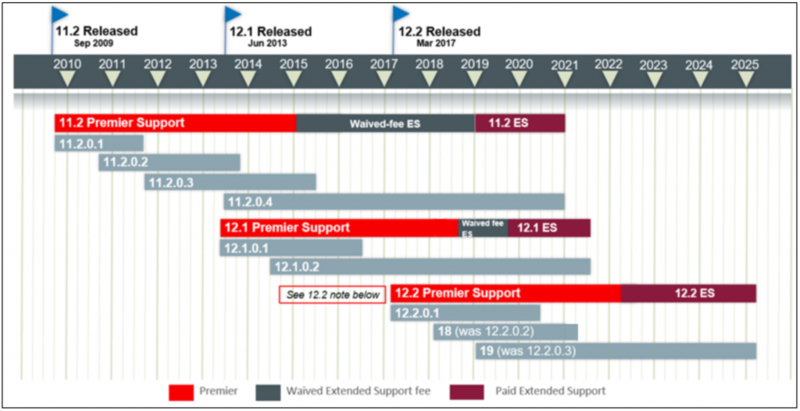 On December 31st 2018 Oracle 11.2.0.4 will transition from ‘Waived Fee’ Extended Support to Sustaining Support. On July 31st 2019, Oracle 12.1.0.2 will transition from ‘Waived Fee’ Extended Support to Sustaining Support. Before then you should upgrade your Oracle Databases to 12.2.0.1 or, even 12.2.0.2 (now known as Oracle 18). Oracle offers Premier Support for its software products for a defined period, typically 5 years from the first product release. Once Premier Support ends, Extended Support is available for customers who wish to retain Premier-like support at an additional maintenance cost. Oracle have recently offered Waived Fee Extended Support for database version 11.2.0.4 until EO 2018 and for 12.1.0.2 until mid-2019. Once Waived Fee Extended Support (or Premier Support where there is no Waived Fee Extended Support) ends, then the product enters Sustaining Support. Sustaining Support is a lifetime support level available for as long as Oracle customers continue to pay support fees are paid. This ensures that Oracle will always respond to some extent and that products are never actually desupported. For more information on support levels access Oracle Support Software Policies Document. Guarantee familiarity of support staff if/when you need support. This could impact the supportability of your database and BCS recommends remaining within Premier Support where possible. BCS first objective is to drive awareness around Oracle Database 11.2.0.4 and 12.1.0.2 transition to Sustaining Support and to offer a fully supported upgrade for 12.2.0.2. Can I continue using Oracle Database 12.1.0.2 or 11.2.0.4 to support my applications? What are the major reasons to upgrade?